Today I feel rather plain, so I threw together what I anticipated to be a mood matching outfit, looking for a lot of ordinary old beige. Apparently, I failed miserably, because there is nothing remotely boring about this ensemble. My favorite part is the shoes. I have a weakness for everything from *REIGN., but these New Group Gift shoes are absolutely brilliant. They come with a HUD that allows for over a dozen full color and color/wood platform options. You can get them by joining the *REIGN. VIP group, which has a small $250L fee to join. Get the shoes in the past notices, even at that price they are a steal. Once again, Strawberry Singh (Berry) has come up with a great list of questions to get us all thinking about our Second Life in a new way. I decided to get in on the action and participate once again, because this is a sort of Therapy for me and gets me out of the 'click, click, post' mode of blogging. Remember to share your answers on Berry's blog so other's can take a look at your answers and vice versa. Meme instructions: Answer the following 20 personal questions about your Second Life. Don’t forget to share a link to your post in the comments on Strawberry Singh's Blog! When and how did you discover Second Life? I was watching the news one night and there was a feature about Second Life, they showed various aspects of 'Role Play' groups, and that's what I thought SL was, just different communities of RP with no set game, which worked for me because I am terrible at most games. Did you know about virtual worlds before or was this your first experience with them? Second Life was my first experience with Virtual Worlds, I didn't really know anything like it existed prior to my going in-world to have a look around. Has Second Life met your expectations? Yes and No. It has exceeded my expectations as far as the amazing creativity of individuals and the wonderful friendships I have made, the connections with others. It still fails to meet some of my basic expectations as far as the mundane issues and problems that make the platform difficult for most people to access based on tech and systems shortcomings with graphics and memory, speed, etc. If you could teleport back to the first ten minutes of your avatar’s slife, what would you tell yourself? Take a deep breath, take your time, don't buy those lindens so quickly, really look around. How long did it take you to master avatar flying and driving vehicles inworld? I have yet to master walking, so flying and driving are out of the question. 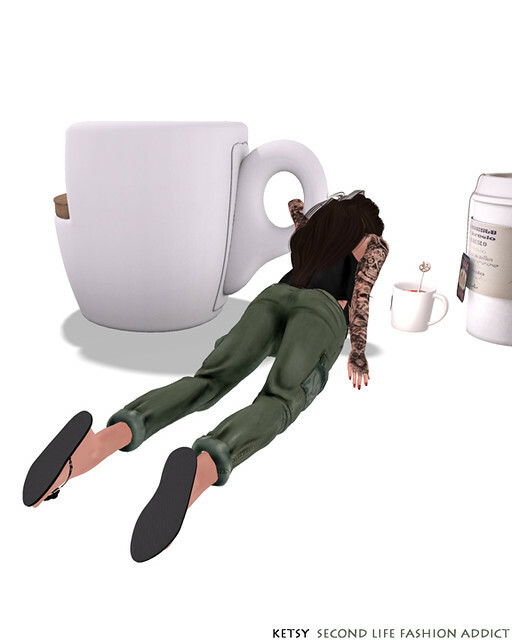 I am a complete SL klutz. Do you have a mystery alt? Not really a mystery, but I have several alts, I don't use them anymore, I did once for business and SIM management when I had Retrology, but I like being me. 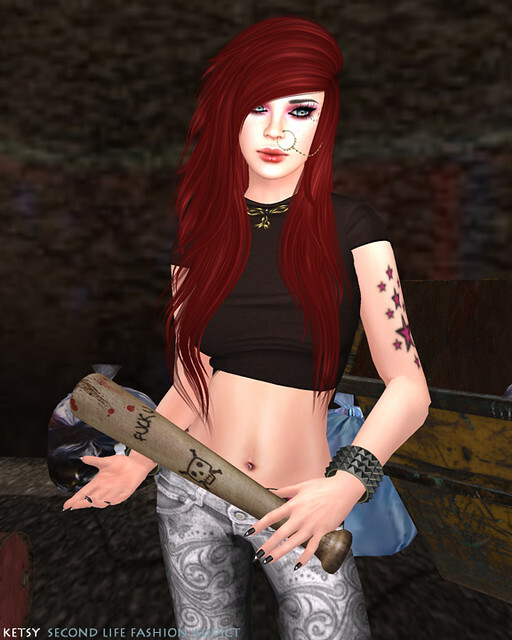 Is your SL avatar a reflection of you, or someone you wished you could be? Lately I change my skins, hair color and eye color daily, the only thing I don't change is my shape. I suppose Kets is me when I was about 21, except a lot taller. Now she reflects my ever changing moods and emotions more than a single ideal. Is there an individual you met in SL that inspired you in your RL? How? Draco Tatsu, my first real love, has inspired me more than anyone else in my whole Second Life. The relationship may have ended, sadly, but he made me want to be a better person in both SL and RL. If I have learned anything about how to love someone well, I learned it from him, and I will miss him for the rest of my life, both first and Second. Do you feel it is easier to create stronger bonds/relationships with people you meet inworld as opposed to the real world? I think you can feel a strong bond with someone you have just met in SL, but only when you actually hear a voice or see their face can you verify that it is real and right. It's hard to get that 'gut' level response in chat, people can be very charming and then turn out to be complete strangers. Did you ever imagine or believe people could fall in love with someone they never met before Second Life? I think people can, and do fall in love in SL, but I think that is why it can be dangerous and wonderful at the same time. I know people who have forsaken a real life partner for someone they met online, and those who are in love even when married or committed to someone in their first life and have to hide those feelings. It can ruin a family unless you set up ground rules for yourself. How has your perspective of dating changed (or not) since you started playing second life? Absolutely, I think you can meet wonderful people from all over the world, and if you are lucky, they can become part of your real life. It is not easy though, it is almost always a long-distance relationship and that is a hardship in the end. How has your perspective of employment changed (or not) since you started playing second life? I am lucky to know people that support themselves on the work they do in Second Life, and I think that is incredible, to have that kind of dedication and endless creativity, to understand the technology and the changing landscape and still be relevant. It is a rare fit, but for some it works, and therefore is as valid as any career. Name three things in both your lives that overlap each other significantly. My love of creativity and art, my love of people, and my sense of joy when others are recognized for their true talents. If you could live your life more immersively in a virtual world, would you? (Kind of like the Matrix) I think I would, though I had been away from SL for a period of almost 4 years at one point. My real life is complicated with health problems and other challenges, escape is always welcome, but I know it can go too far. Sometimes I just wish I could be someone else or start fresh and whole again. How do you think behavior changes for people if they’re inworld vs in real world? Why do you think that is? I know that the ability to lie, deceive, and be cruel is amplified and even accepted by some inworld, in the real world there are often social consequences for these things. For some, they can be free to express their true nature, sexuality, and creativity free from judgement, and that is a wonderful thing. I just wish that the good thing were more easily transported out of Second Life. How has second life consumerism changed your perception of spending habits, the value of money, the need to be “bleeding edge” with fashion? I have a horrible need to horde lots of tiny and cute things in SL, and collect shoes and accessories and wigs like they are diamonds. I spend more than I can afford most of the time, and it is a dangerous situation for me sometimes. But when I spend my spare money inworld, I don't usually buy things in the real world, so it balances out. Do you think virtual worlds like SL drive and redefine human interaction or do they narrow and limit it? I think that SL itself can redefine human interaction, the satellite modes of communication, such as Plurk, Facebook, and Twitter can narrow or limit things. It is all in how you choose to express yourself and what you value, not all interaction is good interaction, and toxic people are everywhere. You need to protect yourself from negative people in general. If technology progressed tomorrow to allow you to send emotions to people the way you’d send text or voice messages, would it enrich your SL experience or infringe on it? I think emotion is completely natural and real in Second Life, and other's being able to know how you are feeling can only help interaction. It may also make you a target in your weaker moments, so you need to guard yourself more. Name three skills you attribute to having learned or honed in second life alone. I have learned more about PhotoShop and other graphic design programs, I learned how to broadcast as a DJ and all the software required to support that hobby, and I have learned about Copyright Infringement and the DMCA, and am more aware of the surrounding issues, for good and bad reasons alike. 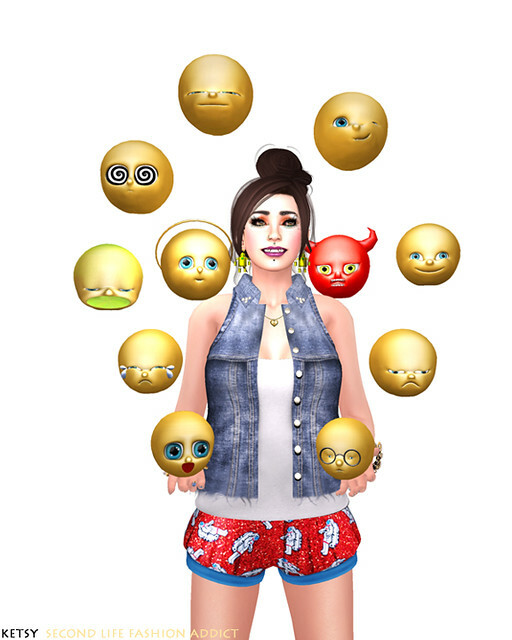 If your grand kids googled your Second Life Avatar’s name, would they be intrigued, disgusted, proud or something else? I think they would be surprised, they would likely find my early SL hysterical, but they would get to know a part of me that very few people have been privy too, an honest emotional and real part - surprisingly.